Finding the best keywords for your SEO campaign is probably the most important decision in the process. Sometimes, the obvious terms may not be best to optimise for. If an SEO campaign goes wrong, most of the time it will be due to poorly chosen keywords. For example, if your business is a pet shop and you want to sell more dog food, an obvious choice would be to target the keyword "Dog Food". Although this is the easiest choice, it may not be the best. Using "Dog Food" as a keyword would mean competing with big brands in dog food, other pet shops, news stories about dog food and so on. 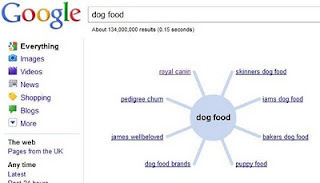 By modifying the keyword to something like "Dog Food in Manchester" you can reduce competition and encourage more local business, which is much more likely to convert into a sale. Using competitive keywords will also push up PPC spend, which again may reduce the likeliness of a sale. We use many methods and tools to find suitable keywords, but below are some of the best. Google Insights (right) is an amazing tool for keyword research. It allows you to compare several keywords, and will return information on each along with graphics to compare interest. 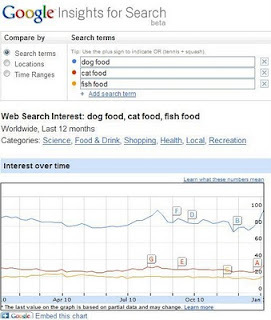 The potential uses of this tool are clear in the example of Google Insights on Pet Food. The data from Google Insights is also downloadable in a CSV format, so it can be imported into any in-house SEO tools you may use. The results can then be used as part of your keyword strategy. This is one of the newer tools from Google, which shows your term surrounded by similar terms which Google has found to be related. If you have a blog which you use to publish keyword-focused content on a regular basis, you can use the Wonder Wheel to find related topics. Tools like the Wonder Wheel and Insights make deciding on the best terms so much easier than it used to be. What we once did as trial and improvement can now be replaced with modern SEO techniques, which means a new SEO campaign can hit the ground running first time.